Most modern cars come equipped with four wheel disc brakes which provide a greater stopping power over drum brakes. 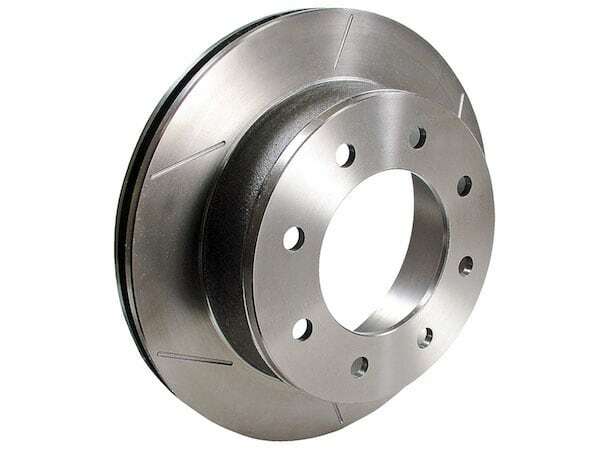 The design of modern brake rotors has evolved over time and offer unique advantages and disadvantages to each style available. In high-end race applications, drivers want rotors with the least amount of weight and that remain cool without warping or cracking. 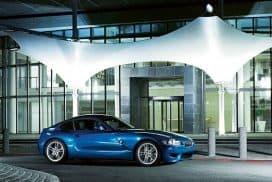 Rotors light in weight not only reduce the overall weight of the car, but also reduce the rotational mass resulting in less energy needed to slow down the car. Excessive heat is the enemy to reduced braking distances. Brake fade occurs when the rotors become too hot, their effectiveness weakens and stopping distance increases. The brake pads will not bite as hard and will begin to feel mushy. These characteristics are true for standard steel rotors, however, carbon ceramic rotors actually improve stopping distance once at temperature. 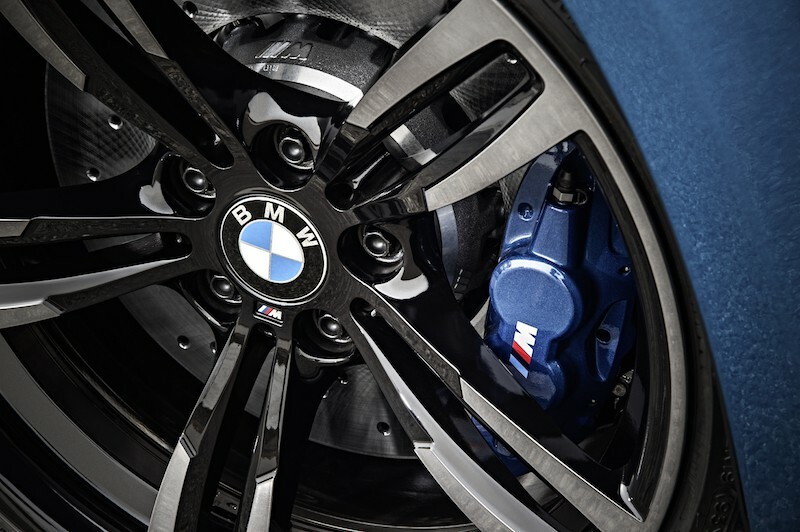 In modern BMW M cars, blue calipers denote a vehicle equipped with standard steel M compound rotors and gold calipers denote a vehicle equipped with the optional carbon ceramic rotors. 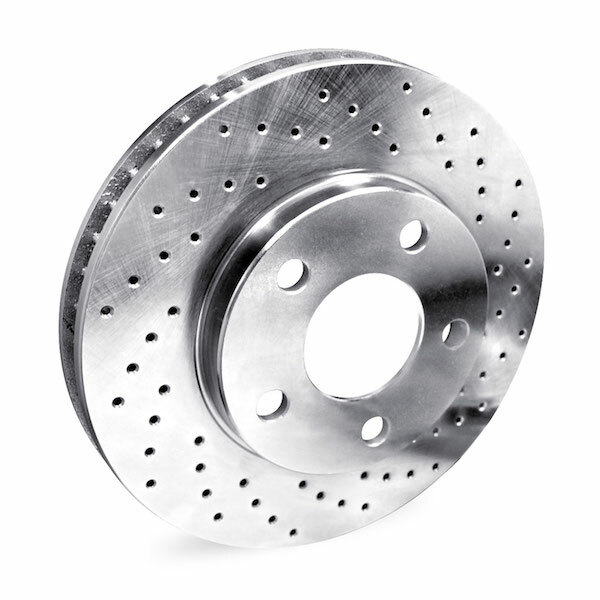 Smooth brake rotors are the standard for most all production cars leaving the factory. 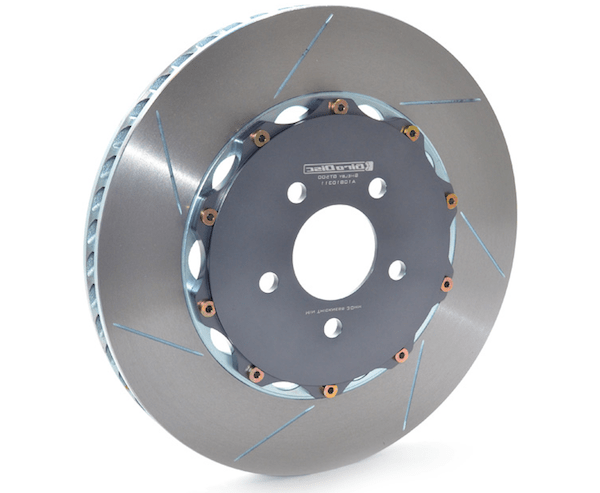 These rotors provide ample stopping power as they have the most surface area in contact with the brake pad. The more surface area available, the more friction with the brake pad. 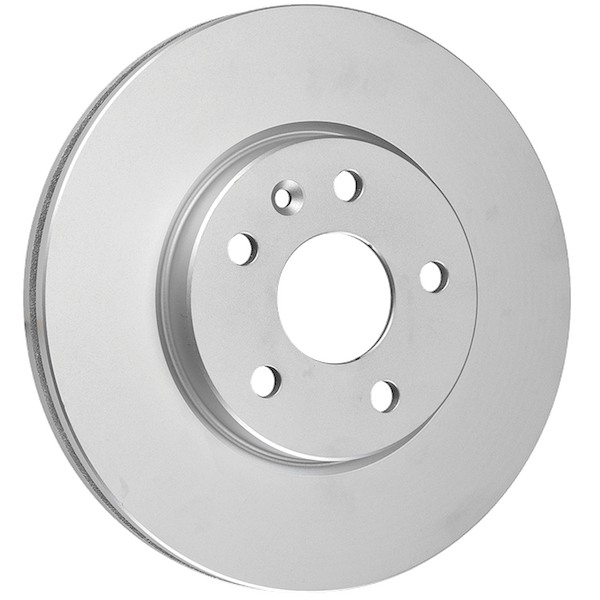 Solid, smooth rotors also act as a better heat sink for the heat created during breaking over slotted or drilled rotors since more material is available to absorb heat. 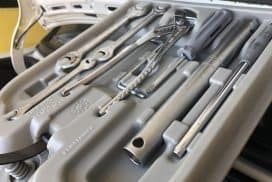 If used for moderate track use, upgrading we recommend stainless steel brake lines to keep a firm feel under heavy braking as brake fade may be an issue. Smooth rotors are least prone to cracking when compared to drilled or slotted rotors. Cross drilled rotors, as the name implies, have holes drilled through the face of the rotor. The original design intent, was to help gases escape which built up between the pad and rotor under extreme braking. The holes also function as a way for water to exit the rotor surface in wet conditions. With less water on the rotors, the brakes have a better initial bite in wet conditions. With modern day brake pads, the need for rotors which help escape built up gases between the rotors and pads have mostly gone away. 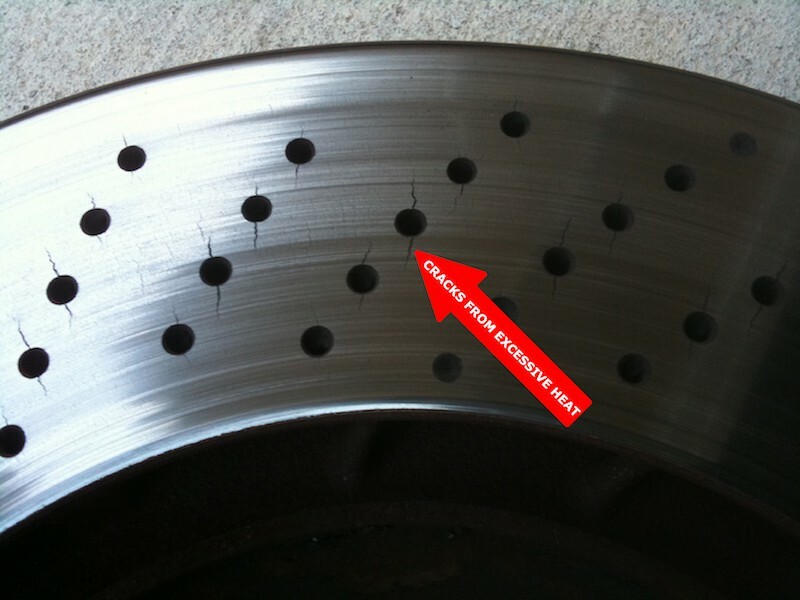 These rotors are of no real functional benefit to daily driven street vehicles and are in fact are prone to stress cracking under extreme heat. See the image below for an example. Drilled rotors can still be found on modern day M cars despite their effectiveness compared to slotted rotors. Slotted rotors feature grooves or slots cut along the face of the rotor. The slots help the built up gasses between the pad and the rotor escape. With the gasses escaping, surface area becomes free for the brake pad can contact the rotor and result in more effective braking. Not all slotted rotors are created equally, the cheap rotors will have a sharp edge on the slots which will bite into the pads and expedite brake pad wear. Slotted rotors are usually the go-to choice for race applications for being the most effective modification to standard rotors. A combination slotted and cross drilled on the same rotor. Floating rotors are essentially a two piece rotor design. The outer ring, which is in contact with the brake pad, is one piece and the second is the “hat” which is attached to the wheel hub. 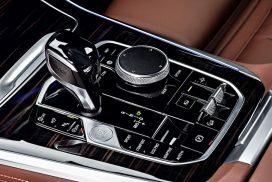 Under extreme braking, the outer piece in contact with the brake pad will remain hot with transferring only minimal heat to the hub and wheel bearings. If the rotor ever becomes warped due to extreme heat, usually the outer ring is the only part requiring replacement rather than the entire rotor assembly which will help reduce cost over time. Most of the floating rotor designs weigh less than the standard steel one piece design. Less weight equals shorter stopping distance and better handling. The Euro spec E39 M5 and E36 M3s came standard with floating rotors from the factory. 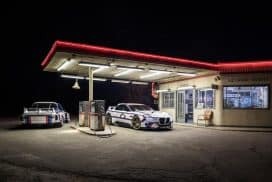 US versions did not come equipped in order to help reduce the overall cost of the vehicle. 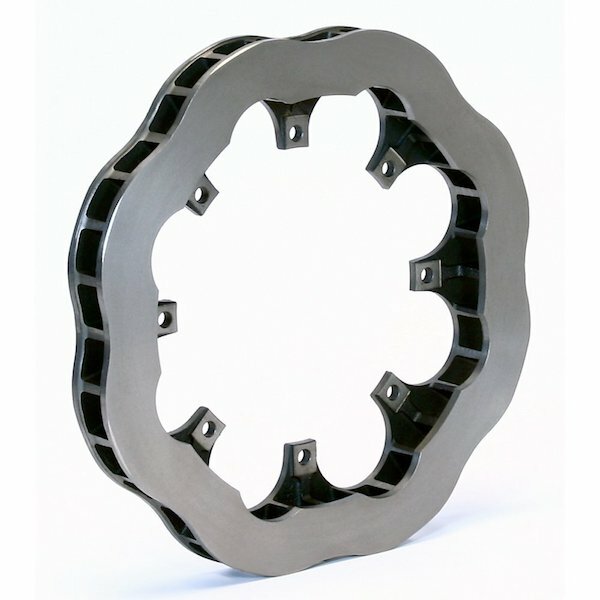 Scalloped rotors are uniquely designed to reduce surface area which effectively reduces weight. In race applications saving weight is critical for obvious reasons. Reducing rotating mass means your car will slow down quicker. However, reduction in weight may be true in this design, the real reason behind these wavy rotors is just marketing. They look cool. Manufacturing rotors just as light with the same surface area by keeping the design a perfect ring shape is possible without wavy edges. The motorcycle industry has been using scalloped rotors the longest and it is slowly now starting to creep over into the auto industry. You will rarely ever see race cars or race bikes running these rotors as they serve no real practical purpose. Carbon ceramic rotors are part of the most advanced braking systems on the market. 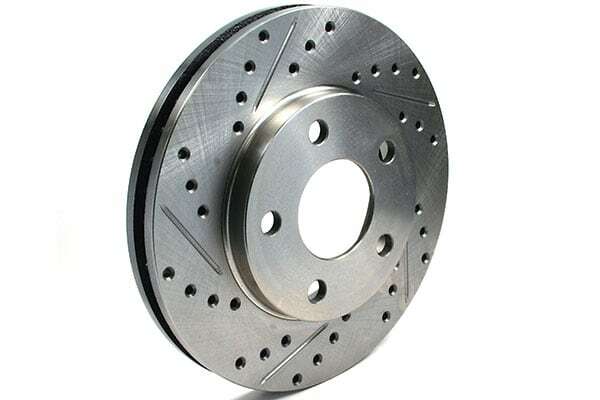 These rotors are the only option for high-performance vehicles which see heavy track time. 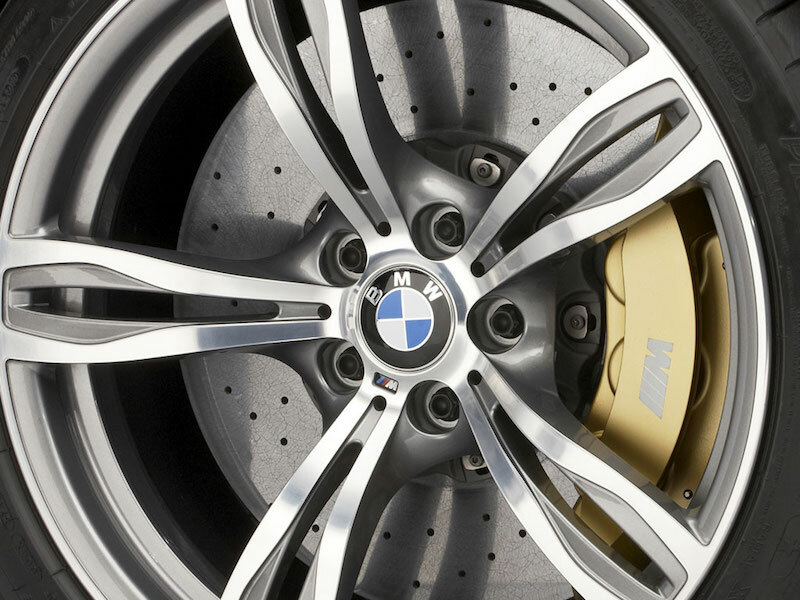 BMW introduced Brembo supplied carbon-ceramic brake rotors with the M6 model in 2012. There are many advantages to ceramic brakes with the only real disadvantage being cost. 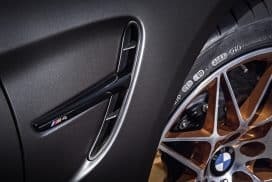 The optional carbon ceramic setup on the current BMW M5 will run you $10,500. Most carbon ceramic rotors will last 93,000 miles for typical road use compared to around 50,000 miles for standard steel rotors. Under heavy heat, carbon ceramic rotors are much more resilient to warping or deforming. Since carbon ceramic rotors are manufactured without steel, the rotors naturally avoid corrosion when in contact with water or salt, unlike steel rotors. Overall weight is about 50% less than standard steel rotors. Reduction in weight increases handling characteristics and improves braking distance. 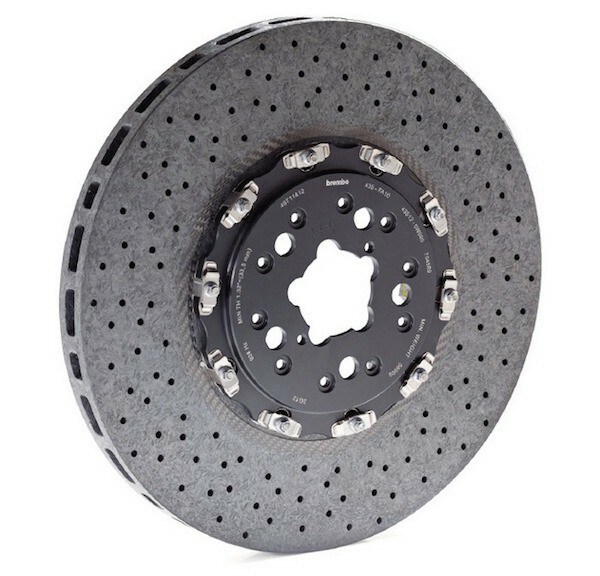 Carbon ceramic rotors are highly effective on the race track but are of no real advantage to a street vehicle to justify the extra cost. 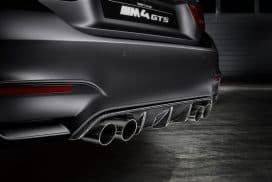 What is the purpose of a rear diffuser and how does it work?